The Welsh Union and regions have welcomed the deal that has settled European rugby's future. The WRU remain in dispute over funding with their four professional teams. But union chairman David Pickering says the new European Rugby Champions Cup can help Wales' top teams. "I am particularly pleased that our four Welsh regions can now plan in earnest for their campaigns for next season and the seasons beyond that," said Pickering. Regional Rugby Wales - the body representing Cardiff Blues, Ospreys, Scarlets and Newport Gwent Dragons - broadly welcomed the announcement. They said in a statement: "The new competitions provide a positive way forward for Welsh Regional Rugby and the ability to drive forward commercial revenues of the most significant rugby club competition in the world. "Fundamental changes within the new European competition structure will see the clubs take a greater stake in significantly growing the value of the professional game, which is crucial in our ability to remain competitive. "The Welsh Regions are pleased that after giving their support to the Rugby Champions Cup last October, a new European platform has now been secured - based on a strong core principle of equal distribution by participating clubs. "We can all now look forward to a more developed, competitive and high quality European competition next season." The next step now is for the regions and the Welsh Rugby Union to agree on a new participation agreement moving forward so we can have peace at Celtic level and a great new competition to play for at European level. So it's a huge step forward." However, they and the WRU have yet to resolve the dispute about the running and funding of domestic rugby in Wales that ran parallel to the European row. The WRU's stewardship of the game in Wales is being debated, with David Moffett, a former chief of both governing body WRU and Regional Rugby Wales, campaigning to take over as chairman of the union from ex-Wales captain Pickering. 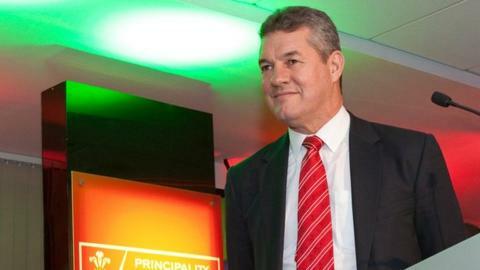 Moffett, who was succeeded at the WRU by Lewis, claims to have enough support from the body's member clubs to force an extraordinary general meeting. Lewis joined Pickering in welcoming the new order in Europe. "I am delighted that we can all move forward with a clear and agreed structure in place for European competition from next season," he said. "Everyone involved in the game, from players through to supporters and sponsors, can start to plan in earnest for the future. "There have been many difficult issues to overcome to reach this stage, but the WRU has remained confident that a resolution would be found and today's unanimous confirmation is clearly good for our game. "A lot of work still lies ahead but everyone involved with Welsh rugby can be assured that we will remain focused and determined to achieve our goals." Pickering said: "This is an extremely important landmark which secures the future of a strong and vibrant European competition structure. "Everyone involved has worked incredibly hard to reach this point and it is in all our interests that we can now go forward together on this issue." The Heineken Cup's last game will be the final at Cardiff's Millennium Stadium on Saturday, 24 May. The new tournament will involve 20 teams, rather than 24, with six from the Aviva Premiership, six from the French Top 14 and seven from the Pro12. The final place will be decided by a play-off. A new European Rugby Challenge Cup will replace the second-tier Amlin Cup and a new third-tier cup will be introduced, called the Qualifying Competition. The heads of agreement - the principles behind the deal - were signed by the nine parties involved on Thursday, bringing an end to a two-year saga. The signatories are the unions from the Six Nations countries, plus the club bodies for England and France plus Regional Rugby Wales, who represent Blues, Ospreys, Scarlets and Dragons. The tournaments will be headed by European Professional Club Rugby (EPCR), a new Swiss-based association, which will replace current organisers European Rugby Cup (ERC). English Premiership clubs withdrew from ERC in June 2012, and have long advocated changes to the present tournament, the Heineken Cup. The issue of who will broadcast the new competitions has been a source of contention but BT Sport and Sky have reached an agreement to share coverage.